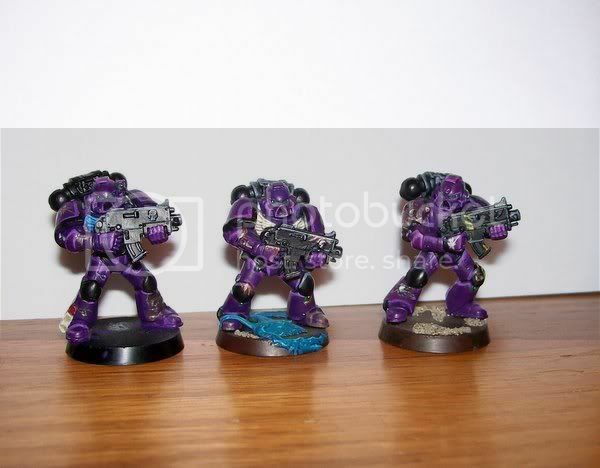 ive made some test models for possible changes to my army&#39;s color scheme. 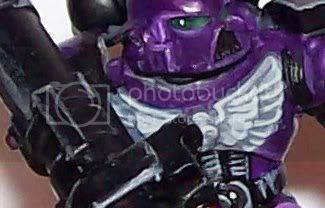 i have changed the chest eagle color and added significant battle damage. i like somethings and dislike other things so i need to know what you think. in this pic i want your opinion on the dirt, should it stay or should it go? If i were you, I&#39;d make keep the dirty look to the feet, loose the bone color eagle and use the blue one, the battle damage looks good. I&#39;m not sure on the base trim though, ether it should be plain or yor danger markings. Holy cow, those are amazing! 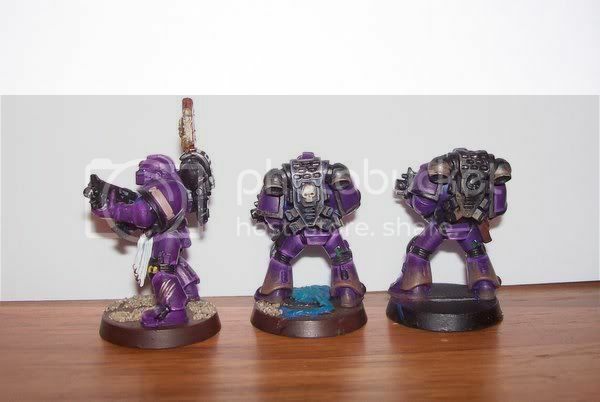 I really love the highlights, they make the models stand out. 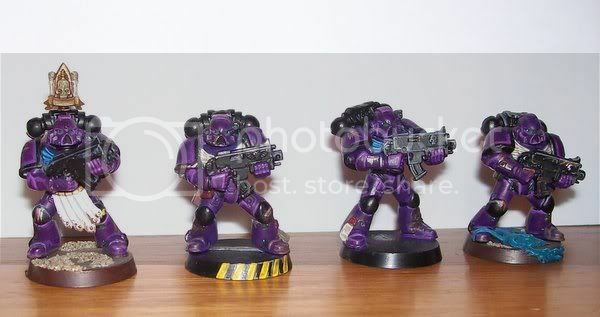 There great models,and the dirt should stay.you should try run a modelling knife through the slash marks,to deepen them and give a good effect. The dirt should stay, it&#39;s well done and makes them look realistic, like they&#39;ve just been into a battle. Great! Those are very good. I like the colour scheme. 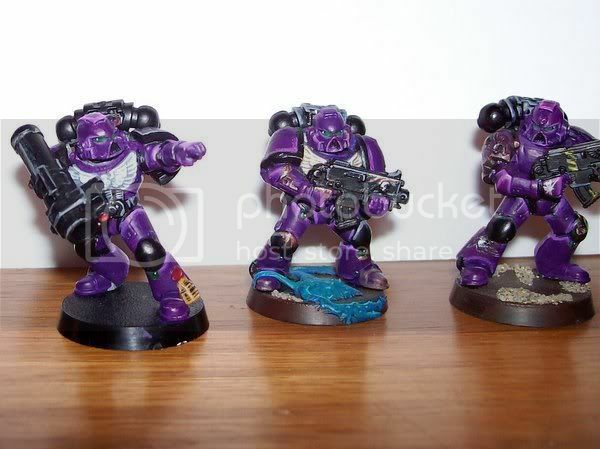 Purple isn&#39;t a commonly seen colour scheme. thankyou for all the great feedback. 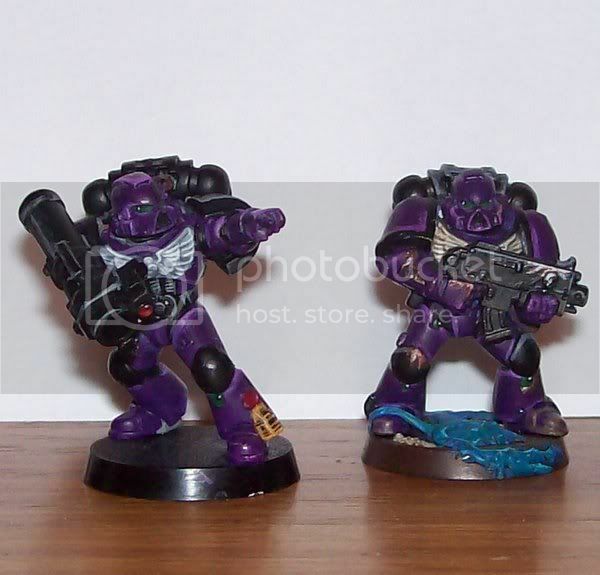 i was thinking alot about the marines and i was wondering what you guys would think of a chest eagle that was white (codex gray shaded up to white) this would keep my palette to purple, black, and white which would leave room for another secondary color that could go on a shoulder pad lining and maybe a kneepad, this secondary color could lighten up the model but I am not sure what that color should be, my current thought is teal.